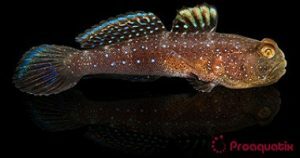 A type of watchman goby that occurs in multiple color morphs, some black with white splotches while others more cryptic. Watchman gobies are generally characterized by eyes that are located at the top of their heads, an adaptation that is suited for sight. Watchman gobies are naturally found in association with snapping (or pistol) shrimp of the genus Alpheus. The gobies spend most of their time “on watch” for predators and depend on the shrimp to excavate and maintain the burrow. The snapping shrimp maintains contact with the goby with one or both of its antennae because the goby will flick its tail rapidly to signal for any necessary retreat. Natural range extends westward to the Andaman Sea, eastwards to eastern Caroline Islands, and southward to the Great Barrier Reef. Most commonly seen sitting at the entrance of its burrow, often venturing away from the entrance at feeding time. Prefers a sandy bottom. When keeping several individuals in the same aquarium, the group usually breaks into isolated pairs, with each pair sharing the same burrow. Ideal scavenger in reef aquariums. Watchman gobies will also burrow and aid in shifting the sand in an aquarium.